No wasted travelling time and associated expenses. *We provide a projector and screen within the course rate. We can also supply laptops if necessary for a small hire charge of £15 / person. Current daily rates for public course are around £300 per person, so onsite training Excel at your own offices in Harrogate can work out significantly cheaper. All you need is 2 or more employees who can benefit from training and you will save money. Please call us free on 0800 2922842 to discuss your requirements, or use our contact page to email us. An Excel course at a public training centre currently costs in the region of £300 per person, plus VAT. If you have only one employee to train, this may be the best choice in respect of cost. However, sending a number of staff onto public courses can prove expensive and there are other considerations, such as the size of the class. Typically you may find 15 to 20 individuals from different organisations, all of whom are likely to have varied levels of experience in using Excel. This can lead to problems in delivering the right level of training, with the inevitable result that some people will not achieve their learning objectives. Microsoft Excel training can be delivered at your own offices in Ripon to groups of staff for considerably less per person when compared with public courses. In addition, we can tailor training to suit your employees existing levels of experience and ensure that everyone achieves their objectives for the day. For full details including pricing please visit our Onsite Training page. A third option is the live online course, or what we refer to as ‘virtual training’. This is a very cost effective way of gaining valuable Excel skills. Normally delivered on a one-to-one basis, this training can be fine-tuned to suit the individual. For further details please visit our Virtual Training page. We now deliver Excel training in Chester at all levels from Foundation right up to Advanced. From just £55 per person, our onsite training rates work out much cheaper than sending employees onto public courses. In addition, we can provide a more tailored training solution and ensure that everyone gets the precise training that they require. For more information about arranging Excel training courses in Chester, please visit our onsite training page. Alternatively you can call free on 0800 2922842 or email us below. We are specialists in onsite training and qualified to deliver MS Project training at Foundation, Intermediate & Advanced levels. Our trainers have years of experience not only as Microsoft Project trainers but also as project managers themselves. MS Project can be difficult to self-teach and there are a number of potential traps for the new user. Our Microsoft Project courses have been designed to teach you the correct way to use the software and thereby gain the most from it’s many features. Choosing a training provider is clearly an important decision and you might wish to take a look at what clients have to say about our services on the Testimonials page. Onsite training can be a very cost-effective method, especially if you have 2 or more employees who can benefit. The average public Microsoft Project course is around £280 per person, whereas our onsite group rate can work out as little as £55 each. For full details including a breakdown of our training fees, please visit the Onsite Training page. If you are unsure as to which level of training would best suit your staff, we can provide you with a free training needs analysis. This consists of a quick and simple tick-box form which takes just a couple of minutes to complete. We will then be able to advise on the correct training schedule and tailor the course to your employees and Company’s requirements. For further information about Microsoft Project training courses in London, you can call free on 0800 2922842 or email us below. Onsite Excel training at your own offices can work out to be much cheaper than sending employees onto public courses. Our onsite daily rates can be as little as £55 per person when booked as a group. In contrast, the average public course is around £280 per person. You can see more details about our in-house Excel training option including a full price breakdown on the Onsite Training page. If you have 2 or more staff who can benefit form Excel training, you will find it far cheaper to arrange an in-house course at your own offices. The average cost of public Microsoft Office training is around £280 per person, whereas you can arrange an Excel course at your own offices in Preston from as little as £55 per person. You can read full details, including pricing on our Onsite Training page. We are qualified to deliver Excel training at Foundation, Intermediate & Advanced levels, along with VBA. We would be happy to provide you with a free Training Needs Analysis which consists of a quick and simple tick-box form. Based on the information you provide we can then determine the correct level of training for each member of staff. In addition, we would be happy tailor a bespoke Excel course to suit your exact requirements at no extra charge. For more information about Microsoft Excel training courses in Preston, please call 0800 2922842, or alternatively email us on info@microsofttrainingcourses.org. Please note that these rates are per group, not per person and include personal Microsoft training manuals and course certificates. All prices are + VAT. We will provide all the equipment needed including a projector and screen. We can also supply laptops if required for a small rental of £15 each so that you can use virtually any office for your Excel training course. Microsoft training continues to be in high demand right across the UK, despite the tightening of budgets which many organisations are experiencing. One reason for this is the value for money that such courses represent, particularly MS Excel training. The results are observable immediately after the course has completed and the beneficial effects continue as the new skills are applied to every day office tasks. Traditionally such training was gained by attending public courses, held at training centres perhaps some miles distant. However, the trend for Microsoft skills-based courses today is for onsite Excel training, which can be delivered at your own offices anywhere in Stoke on Trent. 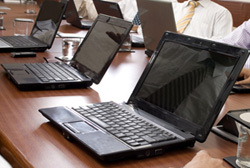 No special facilities are required as we provide all the necessary training equipment, including laptops if required. You can see details on our Onsite Training Courses page. In just 1 day you can skill a number of employees to a higher level which will make them more efficient and productive with Microsoft Excel. Many people are self-taught with Excel which can be a great way to learn, however there is an old adage which says that “you don’t know what you don’t know”. This has never been more true that with MS Excel. The software has many features designed to make office spreadsheet tasks easier, but many are relatively unknown even to regular Excel users. Investing in a 1 day focused onsite training program will give your employees the skills they need to complete their tasks more quickly and for much less than the cost of public training courses. We provide all the equipment needed, including laptops if required. You can read more about our in-house training option on the Onsite Training page. Please feel free to call us on 0800 2922842 for an informal, no obligation discussion about your training needs. We will be happy to provide you with a free Training Needs Analysis form which will help you to determine the correct Excel course for your employees. A completed booking form is all that we need to secure your training and you will not be invoiced until the course has completed. As leading UK specialists for in-house training, we can deliver Microsoft Office courses at your own offices for less than the cost of public open events. We are qualified to provide training in Access, Excel, Outlook, PowerPoint, Project, Publisher, Visio & Word from Foundation right up to Advanced VBA levels. We provide laptops and all the necessary training equipment, so that you can use virtually any office as an IT training suite for the day. The typical cost for a public Microsoft training course is around £250 per person, whereas our low in-house training rates can cost you as little as £55 per person (based on a group of 10 delegates). You can view full details, including pricing on our Onsite Training Courses page.